I’m so excited! I’ve just purchased Make Over Your Mornings and Make Over Your Evenings! 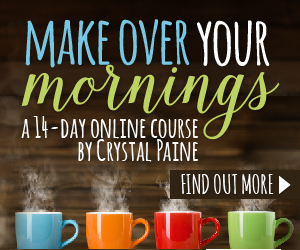 These are two courses offered by Money Saving Mom – Crystal Pain. In a busy, full house like mine, routines are important. Organization is key. And, since we’ll be adding another child sometime soon (did you miss that announcement? ), it’s time for me to make sure I’m starting and ending my days in a good way. yelling at kids that are slower than I want them to be. Instead of sending them off to school with grace, I often send them off with a “Go, go, go don’t miss the bus!” I’d much rather send them off with a sense of calm and love and readiness for whatever the school day may hold. At night, I’m tired from “catching up” all day and just want to crash. I end up wasting a LOT of time, leaving much on my to do list for tomorrow. Then, the cycle of starting the next day behind begins again and just continues on. I’m ready to have a make over! I hope you will join me. I will start Make Over Your Mornings on May 1st. I will start Make Over Your Evenings on May 15th. Will you join me? I’ll be blogging about my journey and would love to hear what you learn too! Just click on the link of the course you want to take and find purchase information there! (Disclaimer: the links are affiliate links and I will receive a small “kick back” from your purchase). Order your course (I got both for less than $20) and comment below if you are joining me!